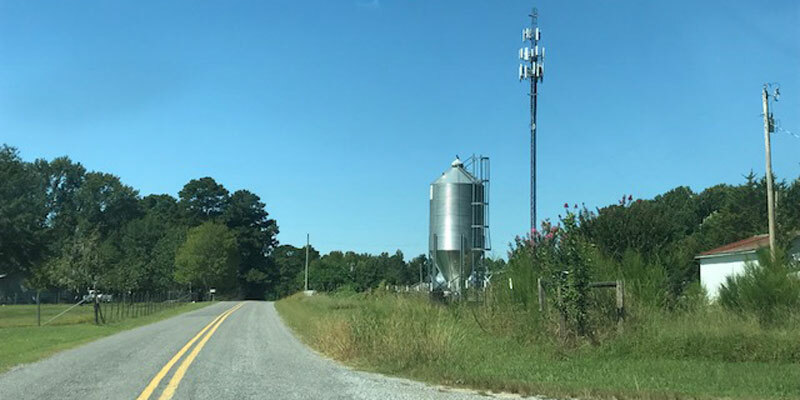 Nestled between knee-high grass and mobile homes, a cell tower in this small community in Cullman County will soon demonstrate cutting-edge technology. It is here that AT&T will run fiber-optic cable and then beam internet signals to nearby homes with antennas installed on their rooftops, a service known as fixed wireless. This rural area in Alabama is one of the test cases for the new technology, which AT&T will use to deliver internet to areas where it’s not cost effective to build out fiber-optic infrastructure. Taking a break from her bingo game at the nearby Brushy Pond Senior Center on a recent morning, local resident Imogene Johnson said she’d be happy to have another internet option. She currently uses her Verizon cell phone as a hotspot to get internet service at her home. In an age where many local governments are looking to get into the internet business by building taxpayer-funded networks to serve area residents, often piling up millions in debt, new technologies such as fixed wireless could be a solution to solving the rural broadband gap. Until two years ago, 10 mbps was the broadband standard set by the Federal Communications Commission. Even though the FCC has raised the standard, 10 mbps is still plenty adequate for people to stream video on multiple devices in a home. State Sen. Paul Bussman, R-Cullman, said the technology is key for people in this area. AT&T began testing the service in Walker County early last year. About 65 households in the Carbon Hill area were paid to participate by installing antennas on their houses to receive the wireless internet signal from a nearby cell tower. The company is also testing technology that beams wireless internet signals along antennas installed on power poles, which means the internet could reach any home with electric service. Tom Struble, technology policy manager for Washington, D.C.-based R Street Institute, said that fixed wireless service looks to be a strong alternative to the expensive process of running fiber-optic cable to homes in out-of-the-way areas. And faster wireless services are coming. Tech experts anticipate that 5G technology will provide download speeds around 1 gigabit per second. AT&T said it plans to provide the fixed wireless service to more than 65,000 locations in Alabama by 2020. It has launched the same service in rural regions of several other southern states, including Florida, Georgia, Kentucky, Louisiana, Mississippi, North Carolina, South Carolina and Tennessee. Ma Bell plans to expand fixed wireless to another nine states before the end of the 2018, from California to Ohio. The FCC’s Connect America Fund is paying for the projects. Private providers such as AT&T accept the money, which is collected on telecom bills, in exchange for expanding internet services in rural areas that lack options and are selected by the FCC. Johnny Kampis, a resident of Cullman, is investigative reporter for the Washington, D,C.-based Taxpayers Protection Alliance.